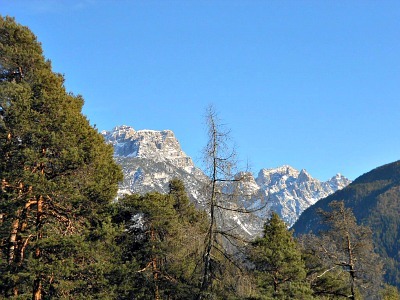 The Centro Cadore, Cadore's Heartland, Offers an Ideal Blend of Nature and Culture. The Centro Cadore, as its name suggests, is the most central section of the region, and it spans over the territory of the municipalities of Pieve di Cadore, Calalzo, Domegge and Lozzo di Cadore. 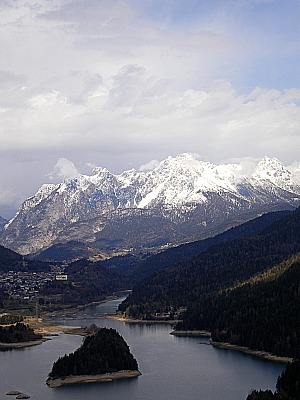 This area is flanked, in all of its length, by an artificial lake ("Lago di Centro Cadore"; see the image above) that was created in 1946-9 for hydro-electric purposes, and whose level of water varies a lot, depending on weather conditions and water extraction (the basin is still in use today). For the purpose of this page, I will deal with the section from Calalzo to Domegge, sketching also Lozzo di Cadore and Pieve di Cadore, which both have a dedicated page. As a matter of fact, in many ways, in Centro Cadore there isn’t much separation between the four towns that form it, so that it looks more like a small conurbation. Most of the inhabitants of the region are concentrated here, and unless you know it, it is hard to tell where one town ends and the other one starts. This is also Cadore's most highly industrialized area, specialized in glasses and lens production, so that along the main road there is an almost uninterrupted built-up belt made up of a mixture of residential and industrial areas, which is not very attractive. Most of the points of interest are therefore to be found off the main road – off the beaten path, as it were – as the town centres are not particularly appealing either – but, as we'll see, there are a few exceptions. So, as a rule of thumb, it is best to be prepared to head off the beaten track for the more interesting sights – and my purpose here is to help you to locate them. Of the four townships that form Centro Cadore, Calalzo di Cadore is perhaps the least interesting – for almost obvious reasons, one would be tempted to say, as this is the terminus of the railway line that since 1914 connects the region of Cadore to the main cities of Veneto. 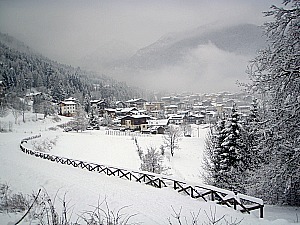 Traditionally, therefore, this place has always acted mostly as an arriving and ‘sorting’ hub, from where visitors and tourists would then continue by bus their journey onwards to their final destination, further up the valleys (be it Cortina, Auronzo, Sappada or elsewhere; below, see a winter image of Calalzo). The presence of a railway station has also meant that Calalzo, being more easily accessed, would naturally become – together with neighbouring Domegge – the industrial core of the region. Having said that, Calalzo is not completely devoid of interest either. Firstly, within its territory there is a very important site – in fact, the most important archeological site in Cadore. The area called Lagole is ‘squeezed’ in a narrow strip between the railway line and the lake. This may not sound poetic at first, but the place is well worth visiting; in fact, it is one of the first sites from which civilization spread in the area, inhabited in Prehistoric times by the Paleo-veneti (the people that gave Veneto its name). Because of the presence of springs, the Paleo-veneti devoted this area to the cult of a Water Goddess, and the findings are displayed in the Archaeological Museum in Pieve di Cadore. Albeit for different reasons, these very same springs still make the area interesting today: rich in iron, it was thought at one point that they could possibly be exploited as mineral water and a spa – something that luckily did not happen, as it would have completely spoilt the beauty of the place. But the reddish sediment visible in the streams’ bed is a clear indication of the presence of iron minerals, making this a fantastic drinking water – so come armed with a bottle, and help yourself to the fountain (which lies in a rather hidden position). Or simply come to enjoy the peace and quiet (if it’s not a hot summer’s day, when you may have to contend the space with families and bathers), sit by the dark-azure natural pond that has formed at the bottom of the springs (the 'Laghetto de las Femenes' – the 'Young Ladies' Pond', from the name of a legend; see Marmarole), and let yourself be carried away by the calming sound of gurgling water (see image below). As this used to be an ancient place of worship, don’t be surprised if you feel you’re “not alone”: I’ve come here many times, and I've always felt as if the space is teeming with presences. Whether you believe in this or not, in any case there’s nothing to be scared of: if anything, this only adds an additional, ‘unseen’ layer to the richness and sacred quality of the place. 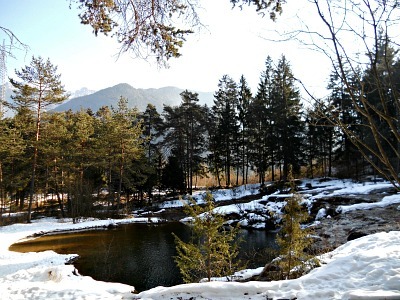 In the experience of self governance, lasted over several centuries, and carried out through the institution of the 'Regole' and the Magnifica Comunità di Cadore, the woodlands were considered inalienable and indivisible property of the original population of Cadore. In the text of the Statuto of 1338, the Comunità of Cadore stated: "We decree and order that all the woodlands of Cadore be free and common to all the people of Cadore, and not to any stranger, and that each man in Cadore can freely, and with no fee, at all times work, and allow other people to work, in these woodlands, timber and other woodland of any sort". The woods were therefore private property of the people of Cadore; in particular, the head of families, who represented their 'fireplace' ('fuoco' in Italian; a word representing every single homestead within the institution of the 'Regole'). It was thus created and rooted, in this way, a system of forest management which was respectful of the natural ecosystem, and geared to its auto-perpetuation; a system which, nowaydays, we would define 'sustainable'. Adolfo de Berenguer, one of the founder fathers of silviculture in Italy and Europe, in his monumental work "Studies of Forestry Archaeology", maintained that the timber of the firs and spruces of Cadore was "superior for elasticity, quality and strength than any other of its kind in Europe". In the area had already been found several bronze objects of a certain relevance, as occasional discoveries had already taken place since the end of the 1800s, and until half of the 1900s; amongst all, the most important recovery was probably that of a situla with an inscripiton in the ancient Venetian language, found in 1914 in the vicinity of the railway station. Between 1947 and 1949, came to light numerous handles of bronze simpula, with inscriptions, and Roman coins in bronze, copper and silver. Subsequently, during the digs organized in 1949 and early 1950, were found some small bronze artifacts with figurations of animals and warriors, more simpula handles, lamina worked with the technique "a sbalzo" (embossed), other objects in bronze and several coins. From 1950 onwards, thanks to the intervention of the "Soprintendenza" to the Antiquities in Padua, came to light the majority of the 'ex-voto' of Lagole: several simpula handles, more fragments of embossed lamina, daggers, coins, tintinnabula, and more. If only thirty years ago we had looked at the landscape from this position -- towards the lake of Centro Cadore, glimmering underneath -- we would have enjoyed an unhindered view. The sight would have reached the distances of Mount Piduél, Spalti di Toro, Duranno, thus allowing us to appreciate the splendid scenery of the valley at its best. The widespread conviction that the forests' surface is progressively reducing cannot always be applied to European forests -- and therefore to those of Cadore neither. In order to find such extensive woodlands, we would have to go back at least five centuries. From this territory, the people of old would have gathered their living, and they would have contended the woodland the space where to cultivate the produce of the land and raise their animals. Along the course of the centuries, a sort of balance created itself between agricultural and forest surface; it was a landscape in continuous evolution, in relation to the demographic increase or the physiological decrease in population following wars or pestilence. With the economic boom after WW2, the mountain economy has deeply changed, and new models of development have been pursued; the consequences on rural space are there for all to see. Now, the awareness is being affirmed that a harmonic relationship between woodland and open spaces needs to be re-established, and this is the fundamental premise on which to revamp and develop a new concept of tourism within the economy of Cadore. The Anguane were beautiful girls who would comb their hair along the streams, but they were also double-natured creatures, with reversed goat-feet. Thus, the Anguane would be remembered in these two different ways; essentially, they were pagan nymphs of the woodlands, connected to the waters, whose legend loses itself in time of the Celts. Their very name seems to derive from Celtic inscriptions; then, they somehow reached the Middle Ages. Tradition maintains that the Anguane, during the night, would wash their laundry in the springs of Lagole, and that their cries were so loud to stun one (hence a famous saying in the Veneto: "crying as loud as an Anguana"). They were also skilled embroiderers, well-versed in the art of magic too. There are many legends on these mysterious presences who used to populate the woodlands and springs of Lagole. These legends were set in time immemorial, and it is narrated that the Anguane disappeared for good from Cadore as a hermit -- who used to live in a cave in the Val d'Oten -- practiced the art of magic on them. Their presence is attested in the legends of Cadore, and it testifies to the existence in Calalzo of a Venetian civilization of which important archaeological evidence remains. The character of the Anguane, whose 'cult' remained constant throughout the centuries, was interepreted in a positive or negative manner according to the religious beliefs of the time: the nymphs, beautiful and well-meaning at the time of Celtic paganism, became 'witches' during the Middle Ages, to then fade in memory, which however still survives in the oral tradition. According to what we have learned from Greek and Latin sources, in order to find the first traces of the people who lived in Cadore before the Romans, it is necessary to move to Paflagonia -- a land which faces the Black Sea, in the area correpsonding to actual Northern Turkey. The people of this land ('Paflagoni'), were employed in the Troyan wars against the Greek, guided by their king Pilemene, who died in war. Defeated, they came back to their land, but they found it occupied by other people. Thus, they elected a new chief, Antenore, took the name of 'Veneti', and started to travel towards new lands. According to historic sources, they crossed the Aegean Sea, then rose along the Adriatic coast, greeted -- at the end of their travels -- by the sight of the Venetian lagoon. Along the course of the centuries, the 'Veneti', who had produced a splendid and opulent civilization in the south of the region, extended their presence towards the north, by using important axis of communication and the links constituted by the great rivers: the Piave, Adige, Brenta, Tagliamento and Isonzo. At the time of their maximum expansion, it is calculated that the Venetian region had an extention about threefold compared to how it is now. From the 4th C BC onwards, the 'Veneti' also started to be affected by the Celtic influence: several tribes from Gallia were actually settling along the boundary with their territories. Even though autonomous from a cultural point of view, the Venetian people proved to be open and available to exchanges with their neighbours, with whom they seem to have entertained a friendly relationship for a long time. Equally gradual and peaceful was the passage to the Roman civilization: the Latin right was granted to some cities, then the Roman right; some ancient centers of the so-called 'Paleoveneti' (Ancient Venetians) became Roman municipia (cities); others, became colonies. Gradually, the inscriptions acquired a Latin writing, and the Latin language was adopted; the Roman coin system was also enforced. The water of Lagole is particularly rich in sulphites, bicarbonate, calcium and magnesium. Its chemical composition justifies the fact that, in popular tradition, the water of Lagole is particularly rich in therapeutical properites: this has also been confirmed by clinical examination. It can be consumed as a drink to better the functionality of the stomach (this is mostly due to the presence of bicarbonate); to treat light ailments of the liver, as it can stimulate the (diuresi), and it prompts a mild laxative action (this is because of the concentration of magnesium). It can be inhaled to treat sinuses and rhinites, for the inflammations of the respiratory system, and it can also be used for baths and mud-baths, finding an application in the treatment of the bone articulations, muscles and tendons. In the popular tradition, it is also believed that this water can help heal some skin diseases; it is narrated that the people of Calalzo came here (and brought here their animals) to heal their wounds, and that thanks to the water of Lagole, healing would be quick. If you do come here, however, a recommendation: the water of Lagole should ideally be drunk at the spring, as this would avoid that the development of CO2 provokes the precipitation of calcium and iron. After having visited Lagole (and drunk its water), if you’re up for something a bit more demanding, there is another option starting from Calalzo: at the very end of town, there begins a long and solitary valley -- the val d’Oten. At first, in fact, you will see quite a lot of signs of human activity here, as the area is also managed for timber production, but if you care to continue after the small Caravaggio chapel, you will definitely enter a wilder territory altogether – even more so if you keep going past the end of the tarmac road, a few kilometers further up. From this area, known as Praciadelan, you can enter a land that bears less and less signs of human activity as you go along (below, see an image of the long mountain chain of the Monfalconi, 2,548 m, taken from this open location). From here you can only walk, and as you climb up the valley, on your left side you will have the impressive flanks of the Antelao (3,264 m) – almost vertical walls that reveal the geologic upheaval that gave birth to the Dolomites in all of their drama – while to the right are the towering peaks of the Marmarole (2,932 m; the “Marble mountains” of popular imagination), equally impressive and little-frequented, and favoured by Titian too (who often painted them as a backdrop). The last spot along the way to attract a certain number of walkers is the Cascata delle Pile – a majestic waterfall that, in order to be admired, will require you to walk into a brief, seemingly impenetrable narrow gorge that appears to be carved out of the living rock. Past that point, it will definitely feel like venturing into uncharted territory, and even though it isn’t (the paths are all well marked), from the waterfall onwards the tracks are recommended to experienced hikers only, as continuing would take you to higher and higher altitudes – barren lands devoid of human presence – and would probably require overnight staying at a Rifugio (mountain hut), to descend eventually either in San Vito or in the Ansiei valley below, north of Auronzo. In fact, should you wish to, here you could walk for days on end in complete solitude. If you would rather prefer something more gentle, then I suggest that from roughly half-way up the val d’Oten, you branch off to the right to reach Rizziòs. This is an isolated hamlet, part of the municipality of Calalzo, and possibly one of the most interesting architectural spots in the whole of Centro Cadore. Because of the relatively secluded location off the main road, Rizziòs has maintained a cluster of beautiful wooden buildings that display all the typical traits of the vernacular architecture of this part of the region (below, an image of the old wooden barns – locally known as 'tabià' – in Rizzios). From Rizziòs you can also continue on a section of the “Traversata del Cadore” (see below), a medium-distance walk that would take you past some majestic, bicentenary specimens of beech, leading eventually to the village of Grea. Part of the municipality of Domegge di Cadore, this location is notable for the views that open up on the Lake of Centro Cadore, but also for the interesting, gothic little church of San Leonardo (even though, truth to be told, the church is rarely open: it is best to come when there are Sunday services; below, a picture of Grea's San Leonardo church). Another interesting little church – also very rarely open – is the Madonna della Molinà, which is situated by a bend of the National road between Calalzo and Domegge; it was erected in the 16th century by Nicolò Ruopel, a famous architect from neighbouring Carnia (Friuli). Notice the so-called 'scandole' – thin wooden tiles that traditionally cover the roof of most old churches, and that are generally obtained out of larch wood. The trail that goes from Grea to Rizzios (but of course it can also be taken the other way round) is a wonderful itinerary – at times highly panoramic – that develops with a light gradient in mostly wooded areas. It is characterized, in many of its sections, by rows of trees that flank the edge of a little valley: these are mainly plants whose original function was that of bordering properties, thus marking their boundaries. While the mule track to the side would constitute a barrier for the animals that once transited or grazed round here (mostly cattle and sheep), the trees would in turn also serve the function of strengthening the terrain of the track thanks to their root apparatus – and carry out an ornamental function too, still very much appreciated by whoever happens to walk along this route today. In the first section of the path some majestic centenary beech stand out for their sheer beauty: beech was once considered a very precious plant as it produces very good quality timber, and its seeds, in many respects similar to acorns (‘faggiole’ in Italian; 'fagiolo': bean), are appreciated by a multitude of animals – most notably squirrels, dormouse, mice and several species of birds; also, woodpeckers (Dryocopus martius) dig deep holes in the trunks of the biggest specimens. This bird makes its nest there, and once the nests have been abandoned, they host in turn Tengmalm's Owl (Aegolius funereus) – another species of bird that reproduces itself into cavities and that preys on small rodents in woodland clearings and in the meadows, on which it feeds. In this area Goshawk (Accipiter gentilis) is also present – a daytime predator specialized in flying with great ability among the trees’ canopies thanks to its special morphologic adaptations (short wings to avoid the trunks and branches, and a long tail that it uses like a rudder). 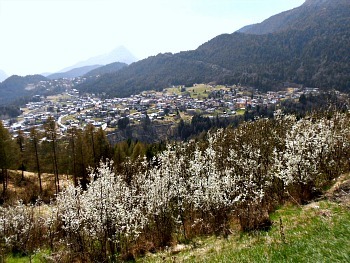 In the image below, a spring view from Grea overlooking the area of Centro Cadore, towards Calalzo. The centre of Domegge in itself does not have very much to offer, apart from an old house originally dating to the 16th century (Casa Valmassoi), heavily remodeled, and that hosts a lively bar/restaurant at street level. There is, in fact, another interesting building: Casa Pinazza, erected as a single massive block reminiscent of Venetian houses (this type of building – the so-called 'casa aulica' – served also as a prototype for the successive 'Rifabbrico' types; see below for further information on this). 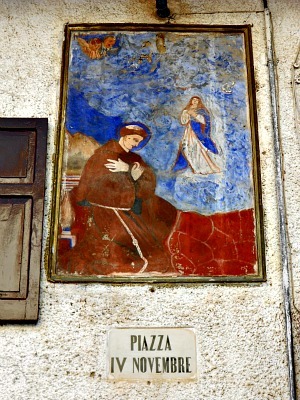 Scattered in the town centre and in the other hamlets are also a number of old houses where frescoes of popular piety are to be admired, such as the one pictured below, in Grea's main square. The massive 19th century church, dedicated to Saint George – white and spacious – is also a good representative of the sort of ecclesiastical architecture that was “en vogue” at the time of the ‘Rifabbrico’. The ‘Rifabbrico’ is an interesting movement dating from the second half of the 19th century, when many old villages were being re-planned like proper little towns and rebuilt in stone, either after damaging fires or as a preventative measure against them. This happened following a disposition of the Austrian government, dated 1845, which imposed – in the event of fire – the use of stone for all new buildings or those parts of old buildings to be reconstructed. For more information on this movement, see also Lozzo, Oltrepiave, Auronzo and Comelico. Back to Domegge now, to lighten the spirit (and boost sugar levels), in the square beside the church is the Pasticceria Da Vià, another institution of its kind in Centro Cadore, with an amazing selections of cakes, sweets, breads and pizzas of all sorts: the perfect place to rest after a walk ... or where to shop before one. From Domegge you can also ascend the long and narrow valley that will first take you to Rifugio Padova (1,287 m), from where several walking and hiking possibilities open up into a wild region that borders (and will connect you to) the Dolomiti Friulane on the other side, dominated by Monte Cridola (2,580 m; seen in the image below from the “Traversata del Cadore” trail). The 'Eremo dei Romiti': An Architectonic Jewel in the Heart of the Dolomites. Another option from the centre of Domegge is to climb to the Eremo dei Romiti (1,167 m). A real, unique architectural jewel in this part of the Dolomites, this Rifugio sinks its roots in an ancient history: its walls are in fact all that remains of the only hermitage to ever have existed in Cadore, dating to the 17th century. For 90 years, this building has hosted a small community of hermits, who later abandoned the place, leaving a legacy of legends and mysterious stories behind them. The architectural compound also includes a small church, dedicated to St. John the Baptist, and it is thanks to this peculiar structural articulation that the Rifugio presents itself with a propositive force that knows no equal in the territory of the Dolomites. The Eremo dei Romiti was left to its own devices for a long time, and eventually it was reduced to ruins. Carefully restored, however, today this is a highly atmospheric location; in order to reach it, a suggestion is to follow the 'Via Crucis' (Passion route) path on the way up, with the possibility of descending via a different route, thus completing a circular trail which is not too strenuous, and suitable for most abilities; in addition, the area is also very little frequented – which makes it a good option if you're searching for a quiet walk. The history of the Eremo dei Romiti is very interesting, as this is what is left of the only convent to ever have existed in Cadore. 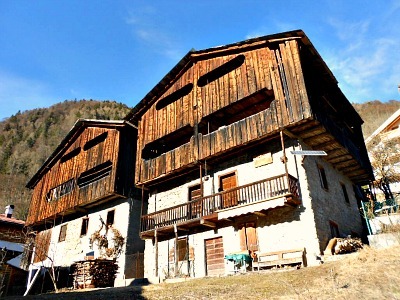 It is located on Monte Froppa at the altitude of 1,164 m, in the municipality of Domegge. it is the only documented hermitage in Cadore, and it was founded by friars in 1720, under the wish of Giovanni Battista Pinazza from Domegge, a Fransciscan friar of the Tertiray order, and the first hermit to be lodged in this place (he was also the first Father Superior of the congregation). A few years later, took place the construction of the church, dated 1724 and dedicated to St. John Baptist; the masonry compound was erected in order to host a small community of Franciscan monks, who stayed here between 1720 and 1810. The idea of a hermitage in this location was also conceived by Father Pinazza. The building had two floors: on the ground floor there were the common and service spaces (kitchen and oven, refectory, cellar), while at the first floor there were eight small cells, really tight and separated by wooden and treillis partitions: the five cells on the second floor were a little more comfortable. Inside the church, recently restored, there is a Venetian school painting that represents the baptism of Jesus and Saint Onophrius the hermit, as well as a wooden crucifix given by Pietro Giacobbi from Perarolo, and made by the famous sculptor from Belluno -- Bartolomeo Brustolon. The vault was frescoed in 1754. Along the itinerary that leads to the hermitage there are the fifteen stations of the Cross (Via Crucis), and a small chapel frescoed with the figures of Saint Francis and the founder, Father Giovanni Maria Pinazza from Domegge. As we will see, however, the hermitage was not to have a long life. The life of the monks who lived on Monte Froppa – and who were called ‘hermits’ because of the secluded location – was strictly regulated by ‘Constitutions’ and ‘Rules’, but the community had in fact quite a short life, as it was suppressed by Napoleonic decree in 1810, which suppressed all the holy orders; the buildings were then abandoned, and fell into disrepair. The period of abandonment was to be rather long, even though every year, in occasion of St. John the Baptist’s day (a religious anniversary on the 24th of June), the whole community of Domegge – as a tradition – went to the hermitage and celebrated mass by the small chapel located downhill. A little distance away from the Rifugio and the old church, this chapel shows the only frescoes to have survived the weathering of time. Despite the tradition of the procession, the abandoned buildings were the victim of neglect and progressive decay; today, though, thanks to the initiative of the municipality of Domegge, the complex has been painstakingly restored (as from 2007-8) for use as a touristic and cultural heritage resource, while still respecting the original destination of the site. In 2009, the restored buildings were inaugurated, and the opening of the mountain refuge (Rifugio) followed soon after. 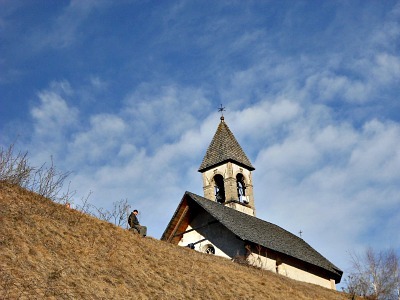 Of the whole compound, the small chapel about 100 metres away from the Rifugio is the only part in a good state of conservation; in the forecast, however, there is also the restoration of the actual church, which – despite being completely empty in its interior – presents the outside walls still perfectly standing (between the end of the 1970s and the early 1980s the roof had been completely redone). (As of summer 2015, in fact, the church is actually accessible again when the Rifugio is open, although works are still under way). The Eremo dei Romiti is fast becoming a prestigious site for its cultural propositions – from classical music concerts to exhibitions of sacred art. The atmosphere of spirituality that has always surrounded the area plays a fundamental role, lending a special appeal to the site. The nature of the Dolomites, the cultural dimension and the spiritual atmosphere create a blend of emotions that has no parallel in the region. At the Eremo dei Romiti – which also operates as a Rifugio – one can find this and much more, such as the art of hospitality and the tastes and flavours of the rich gastronomic tradition of Cadore. 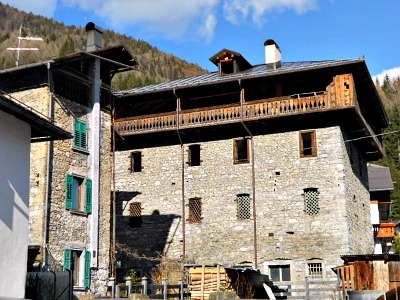 The Eremo dei Romiti offers therefore accommodation and hearty local dishes, while beautiful views open up over the whole of Centro Cadore, with the peaks of the Marmarole and Antelao lurking above the lower range of mountains. The Eremo dei Romiti is open ever day from May to October, and during the Christmas holidays. During the months of February, March and April it is normally open at weekends. Given the slightly different opening times each year, however, it is advised to check the exact times beforehand, if you plan a visit. Their website is: www.eremoromiti.com. 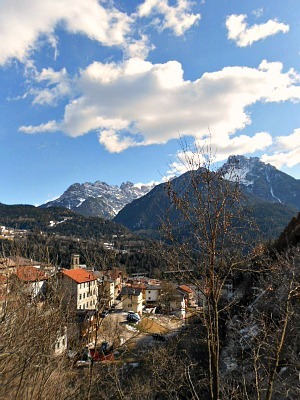 The next township, Lozzo di Cadore, has more to offer in the way of architecture. Reconstructed in 1867 within the ‘Rifabbrico’ movement, the centre of the village has nonetheless retained some fascinating specimens of a type of house with a characteristic, triangular open loft – one of many local variations on the typical Centro Cadore vernacular architecture (see image below). But most of all, Lozzo will reward you with a fair amount of traces from its industrial past, as there is an interesting themed walk along a stream called the “Roggia dei Mulini” (that could be literally translated as the"watermills' stream", but a more technical term is 'irrigation ditch'), which displays a series of three restored buildings that were once used – in proto-industrial times – as mills (see below an image of the village from the highest part of the trail). A circular botanical path ("Sentiero Botanico Tita Poa") has also been devised around Lozzo (see this page for more information), with plaques indicating the most common plant species and their traditional uses; unfortunately, the plaques are only in Italian – but you will have the Latin binomial name; plus, as a curiosity, the name of the plant in the local patois (however, it is to be said that the plaques are not in very good conditions). The church of the Madonna di Loreto is also an interesting sight: a lonely remnant along what used to be the old road connecting Lozzo with Auronzo, running at a higher altitude than the actual road (in the Alps, generally, most ancient routes once stayed away from the valley floors – too easily prone to flooding and other calamities – preferring higher variants instead). In terms of nature, a long, twisting road will take you from Lozzo to the upland of Pian dei Buoi (the “Oxen plateau”) – so called as this once was a popular summer destination for grazing animals. 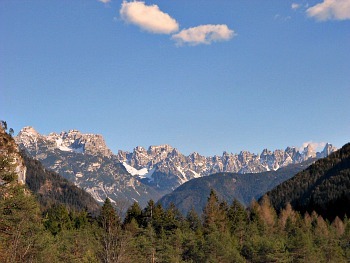 Hardly any is to be seen today, but the area remains great for walking: relatively flat – and so suited to all abilities – it also offers numberless possibilities to get into wilder Dolomite terrain, either towards Auronzo and the Ansiei valley or towards the Marmarole, connecting with paths coming from Calalzo and the val d’Oten through Rifugio Chiggiato (1,911 m). All in all, the ‘feel’ of Centro Cadore could be summed up as that of an area where human activities and the natural environment have historically co-existed closely more than anywhere else in the region – and that is still the case today. Even if achieving a balanced ratio between the two may require a bit of effort, there are here all the right ingredients for a quintessentially Italian Alpine stay that promises to combine natural and cultural elements well.